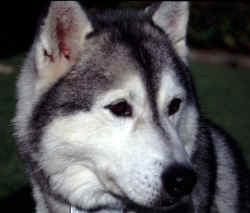 On September 10th, our Siberian Husky, Rizbee, passed away. 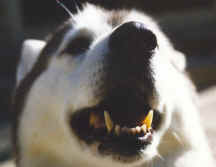 She was 16 -very old for a Husky. She is survived by Asia, our 3 year old and Trout - who is 17 - 1 year older than Rizbee. Rizbee was a part of our lives for many years and will be missed. Click here for more pictures of Rizbee. We had Rizbee cremated and scattered her ashes on Mt. Burdell in a grassy meadow in view of our house. Trout passed away in February 2004 and her ashes joined Rizbee's at the same location in March 2004. Our friends Mark and Glenna exhibited Glenna's photography at the Mill Valley Art Festival. It was a really hot weekend but the redwoods in Mill Valley moderated the temperature a bit. On September 21st, we went to a picnic hosted by the Marin County Open Space District at McNear Beach.